Writing after the liberation of Kraków at the end of the Second World War, Adolf Szyszko-Bohusz reflected on the complex of historical buildings in the city which had occupied much of his professional life: ‘Wawel always formed a separate world in itself. In this microcosm, like in a miniature, all historical events in Poland were reflected, often like a brighter version of all that has happened in our Fatherland. Here, on Wawel, stood the oldest Christian church in Poland; here regal power flourished and faded; and the reconstruction of the Castle was undertaken several years ahead of the restoration of independent Poland.’ For Szyszko-Bohusz, both as architect and conservator, architecture existed on a longer historic scale than the short lives of men. This was cause for hope. Surveying the ruined state of the country, he said ‘whilst we cannot be indifferent to our own war experiences during the years of the Second World War, the salvation of the Castle from destruction gives us hope for the future.’ This faith in the endurance of places was a product of Szyszko-Bohusz’s training, though not necessarily in the Academy in St Petersburg where he studied architecture in the first decade of the twentieth century: it was the result of his immersion in Polish neo-Romanticism and, in particular, in the idea that the historic fabric of Kraków – including, of course, Wawel – was a living lesson in national values. Romantic Nationalism did not end in 1918 but it was changed by the conditions of independence, supplemented by new myths of heroism. The insurrectionary tradition had been a catalogue of failure, producing generations of martyrs and exiles. 1918, however, threw up a victor, Józef Piłsudski. The Head of State of the reborn country was the living subject of a ‘cult’. Even before 1918, Piłsudski’s roles as an underground activist, prisoner and paramilitary had been mythologised, not least by the soldiers who had heeded his call to form Polish Legions at the outbreak of the First World War. But after 1918 and particularly after the coup d’état in 1926, the Marshal became the subject of an official cult. His stern visage glared down from the wall of every state office and school, and appeared on Polish coins and postage stamps. The Marshal’s deeds were taught to children in Polish schools as stirring lessons in conduct and patriotism. The keenest could graduate to the Legion of the Young (Legion Młodych), an association formed in 1929 which promoted selfless duty to the state and personal asceticism – virtues closely associated with the Marshal. In fact, the Polish Legions were themselves the subject of a minor cult in which they were invariably depicted as a brotherhood made up of the selfless and the brave. As a cult, myth was more important than fact. Piłsudski’s Legions were, after all, a small military force, never totaling more than 25,000 men during the First World War. But their symbolic function was considerable. Cults may be fashioned from myths but they also take on material forms and have real effects. Szyszko-Bohusz was implicated in, and benefited from, the Piłsudski Cult. Between 1914 and 1916 he had fought in the Polish Legions, and, in 1916, when in charge of the conservation workshops at Wawel, arranged for the High Command of the clandestine Polish Military Organisation (Polska Organizacja Wojskowa) to operate from the Castle. According to one conspirator, their quarters ‘were so well concealed in the Castle‘s cellars that only a knowledgeable guide could ever successfully find them.’ After 1918, Szyszko-Bohusz enjoyed a place in a trusted caste of former Legionnaires occupying prominent public roles. Just as military formations preceded and effectively created government in Poland, these men had been soldiers first and public figures later. A guiding creed of the Legions had been the primacy of the national cause over any interest which might divide their ranks. Class counted for little (or, as some historians have put it, membership of the legions was itself a kind of elevation, ennobling all who served ). Much has been made of the Legion’s eschewal of ethnic divisions too. As members of a society which had been stateless for so long, it was the state, above all, which commanded loyalty, far less the people or nation. Traces of this attitude survived into the post-war years, not least in the decision to launch the May 1926 coup. Szyszko-Bohusz took on many official duties in the 1920s including that of the rectorship of the Kraków Academy of Fine Art (1924-9) and membership of prestigious bodies including that which oversaw the creation of the Grave of an Unknown Soldier, a monument containing the remains of anonymous combatant who had died fighting in the Polish-Soviet War in 1919, in Warsaw in 1925. And as a conservator employed by Ministry of Public Works from 1929, he had care of the most important historic buildings in the capital (including the Castle and Royal Baths). His considerable body of works as an architect included the presidential summer residence, Zameczek (the ‘little castle’, 1929-30) at Wisła, high in the Beskidy mountains, close to the source of the Vistula river. Eschewing payment, Szyszko Bohusz offered his design as a tribute to his friend, President Ignacy Mościcki, as did the regional authorities in Silesia who funded it. A series of flat-roofed geometric masses with a free plan of open spaces on the ground floor, the Zameczek was furnished with tubular steel furniture and decorated with vividly-coloured walls. By the disappointing standards of official architecture around the world in the first post-war decade, Zameczek was a remarkable fanfare for new conceptions of space and design (and art historian Andrzej Szczerski has identified it as sign of this border region’s bold claims on modernity.) It was also a fitting one for Mościcki, a prominent scientist and politician who had been behind the construction of the State Works of Nitrogen Compounds (Państwowa Fabryka Związków Azotowych), a mammoth complex of smoking chimneys and steel-framed factories on the edge of Tarnów. It should be stressed, of course, that the exterior of Zameczek incorporated a number of picturesque elements too, including rough sandstone cladding which matched its wild setting and signaled, perhaps, an aristocratic habitus. 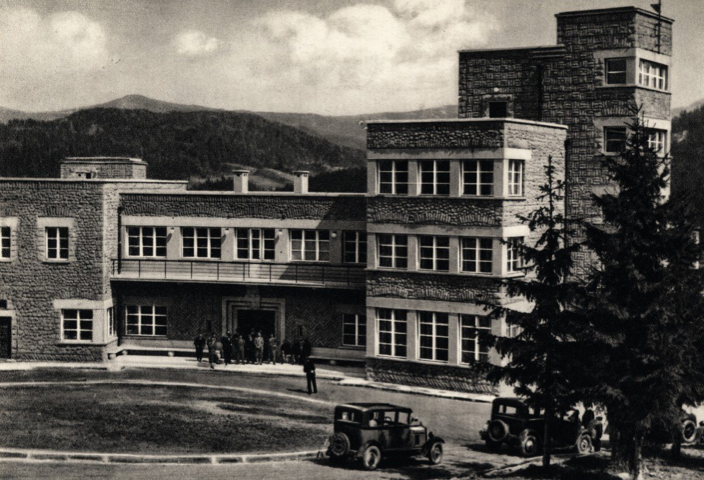 But, as Ewa Chojecka argues, the intended occupant of this ‘new manor’ in the Beskidy mountains testified to a ‘republican-intelligentsia model of modern representation, deprived of any dynastic or ancestral prestige’. Confident in his opinions as well as his abilities, and secure in his place in the ruling elite, Szyszko-Bohusz was by not, or not just, a bureaucrat. His work as a conservator at Wawel was not, for instance, only a matter of painstaking archaeology and diligent renovation. He envisaged his role there as an artist or architect, altering and adding to the historic fabric of the complex according to a vision shaped, in part, by his loyalty to the Polish Legions. For instance he presented a number of proposals to order the site to emphasise its character as the ‘national Pantheon’. 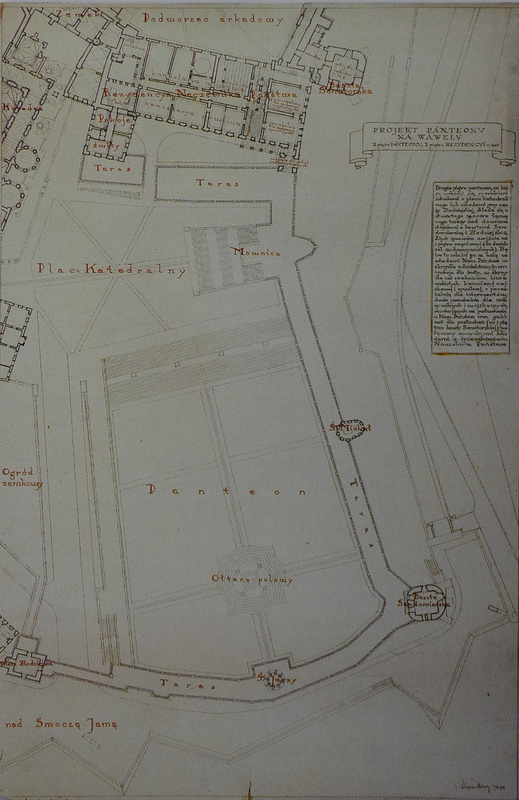 A 1919-21 scheme proposed that a large formal ‘square’ organized around a circular altar be created between the Cathedral and the Sandomierz and Złodziejskatowers. 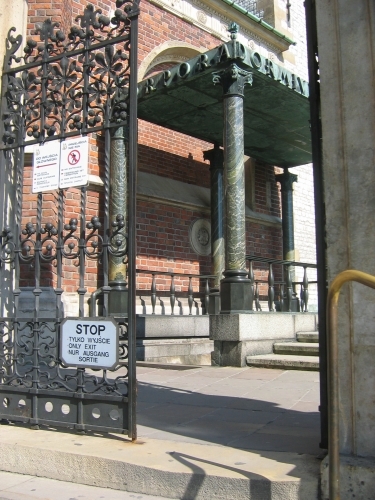 This would have necessitated removing nineteenth century structures such as the ‘ugly’ red brick garrison hospital which had been built by the Austrians to create a clear vista; paving over the archaeological remains of two medieval churches and other historic buildings; and the construction of a long double height arcade of blind arches on top of the ramparts. In a ‘thirty point’ programme accompanying his designs, Szyszko-Bohusz described this terrain as a ‘campo santo’, but he did not envisage a cemetery: redesigned, it would to serve as an orderly setting for ‘great celebrations’ (‘wielkie obchody’) and spectacular rallies. The Pantheon was also to be equipped with a rostrum (‘mównica’) for speeches on the top of the ramparts, ascended by steps like a Roman tribunal. Szyszko-Bohusz came close political dramaturgy, imagining the Head of State (Naczelnik Państwa, the title assumed by Piłsudski at the time) leaving his ceremonial offices with a retinue of staff to take the tribune via a set of special stairs. The scheme was never realized (much to the relief of present-day conservators who point to the destruction it would have entailed). In 1923 Wawel Castle was nominated as an official residence of the President, a decision which presented Szyszko-Bohusz with an opportunity – if not always the funds – to restore ‘splendor’. Restoration sometimes meant repatriation. This was the case of the sixteenth-century Jagiellonian Tapestries which had been plundered during the partition of Poland and only returned from Russia as a condition of the Treaty of Riga signed at the end of the Soviet-Polish War. But more often, the historic furnishings of the ceremonial spaces of Wawel Castel were lost, and only the fixed decoration – celebrated frescoes and ornamental ceilings – could be restored. In fact, in the early 1930s, Szyszko-Bohusz proposed that each of the restored rooms be given an association with different branches of the army. Each would bear the arms and insignia of a division. Although his tribute to Polish militarism was not realized, Szyszko-Bohusz entered into correspondence with the military authorities seeking funds and support. Szyszko-Bohusz’s contributions to the Piłsudski Cult usually took on a rather more austere tone than many of the popular and even kitsch outpourings of enthusiasm for the Marshal. At the end of the 1920s, for instance, he designed a number of sarcophagi and crypts for grand, public funerals organised by the Sanacja regime. His contribution was to present an austere conclusion to events which involved spectacular and usually highly sentimental displays of national unity. The first of these was the interment of the remains of Juliusz Słowacki in the Crypt of National Bards alongside Adam Mickiewicz in Wawel in 1927 after long and elaborate ritual which started in his grave in Paris where he had been buried in 1849. In Paris, the coffin was transported in a carriage dressed with ornamental silks and gilded ornament followed by long trailing procession of dignitaries to L’église de la Madeleine. Arriving in Gdynia after being transported by navy ship, his coffin sailed down the Vistula high on the prow of paddle steamer to Warsaw where it was taken to the city’s cathedral on a towering bier, pulled by eight horses. Then on it went to Kraków by train. Ornamental coins were minted and special editions of newspapers and magazines were published to record this journey and the committal in Wawel. This mournful national theatre far outstripped the elaborate ritual staged for Mickiewicz’s remains interred in the same crypt in 1890, forty-five years after his death in Istanbul. This was, after all, effectively a state funeral organized by the Polish Republic, a point which Piłsudski made forcefully in his oratory over the coffin. Addressing the pall bearers, all legionnaires, he said, ‘Gentlemen, in the name of the government of Poland I bid you carry the coffin of Juliusz Słowacki into the royal crypt, for he was the peer of kings’. Szyszko-Bohusz’s primary role in this national event was to alter the crypt to accommodate the sarcophagus that he had designed. Słowacki was laid to rest within massive block of black Krzeszowice marble with a cross on its top and a silver laurel wreath inscribed with his name on its end. Rather more remarkable in terms of design, was Szyszko-Bohusz’s setting for a sarcophagus bearing the remains of another nineteenth century hero, Józef Bem. Another Polish nationalist whose life had been garlanded with myth, he was renowned as a soldier who survived terrible odds on the battlefield during in 1830 Uprising and the Hungarian Revolution of 1848. In fact, he only escaped his final battle at Segesvár (today, Sighişoara Romania) in 1848 by feigning death. He fled to the Ottoman Empire where he converted to Islam and served as the governor of Aleppo until he succumbed to Malaria in 1850 and was buried in a Muslim cemetery. In 1929 the Committee to Return to the Country the Remains of General Bem (Komitet Sprowadzenia do Kraju Zwłok Generała Józefa Bema) – which had Piłsudski as its honorary patron – arranged for the relics of this secular saint to be transported from his dusty grave in Aleppo to his birthplace in Tarnów. The slow-moving entourage paused at symbolic points on route, including the National Museum in Budapest and, inevitably, the large courtyard at Wawel Castle, where his coffin was displayed to the public. In both places, large crowds gathered in sombre rituals of commemoration. 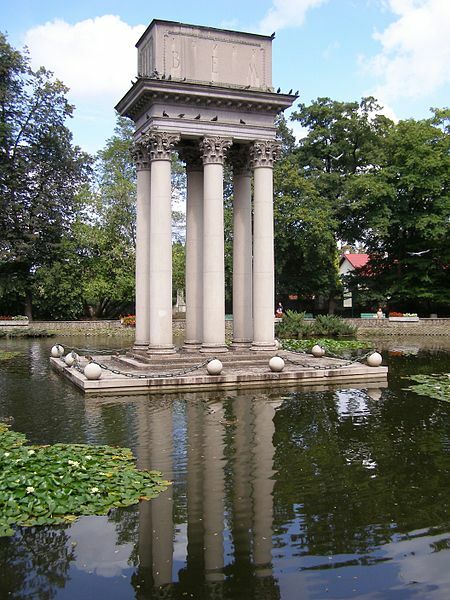 Commissioned by the Mayor of Tarnów, Szyszko Bohusz arranged six tall Corinthian columns on a platform at the centre of a small lake in a picturesque city park. These were to support a stone sarcophagus containing the General’s coffin as well as urns filled with soil gathered at the sites of his battles and Hungarian provinces. Eight stone spheres connected by chains symbolize, in a rather literal fashion, cannon balls around the base of this 12-metre high structure. Whilst precedents for the Bem Mausoleum can be found in the elevated sarcophagi in Greek and Roman necropoleis, Szyszko-Bohusz’s design owed less to archaeology than to poetry. Elevated and impassive, the design was metaphor in stone for lofty values of sacrifice and valour. The most important event in the Piłsudski Cult was, inevitably, that of the funeral of its principal figure, the Marshal himself. 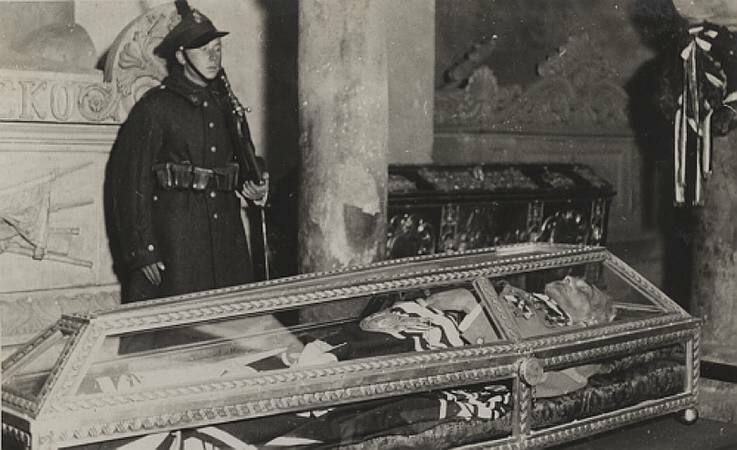 A controversial affair which drew the regime and the archbishop at Wawel into sharp disagreement about the entombment of a former socialist and solider in the resting place of kings, Piłsudski’s funeral took place there in May 1935. His body was embalmed and displayed with his saber, his ‘maciejówka’ (cap), and other ceremonial symbols of rank in a glass coffin. Initially his coffin was placed in the Saint Leonard crypt, alongside the tombs of King Jan III Sobieski and Kościuszko. This could not be a permanent arrangement. The Marshal’s body had not been well preserved and the journey from Warsaw to Wawel – not least on the bumpy cobbles of Kraków – had damaged the air-tight seal of the glass coffin: in consequence, Piłsudski’s body began to deteriorate. The coffin was replaced within months by another designed by sculptor Jan Szczepkowski, albeit without great success: the body continued to decay. Moreover, the crypt itself was inadequate. It was damp and could not accommodate another sarcophagus or the large numbers of pilgrims. They often arrived in festive mood, much to the displeasure of the archbishop. So what was being remembered in this small structure? The new entrance to the crypt – usually described as a baldachin in reference to the cloth of state which covered royal thrones and beds of kings in the European tradition – marked Piłsudski’s status as a victor. It was fashioned from the trophies of war. The stonework was recycled from sections of granite plinth which had supported a bronze sculpture of Bismarck in Poznan until 1918. The six jade columns of Szyszko-Bohusz’s structure were salvaged from the Alexander Nevsky Cathedral in Saxon Square in Warsaw. Dedicated by the Russians to the pro-tsarist Poles who had been executed by insurgents during the November Uprising in 1863 and a clear demonstration of Russian power, the Cathedral had been built between 1894 and 1912 only to be dynamited, after much discussion and a few protests, in 1924-6. The octagonal bases and the Corinthian capitals of the columns were recast from steel from Austrian guns. The symbolism of salvage was clear: no longer serving Poland’s enemies, they were now doing duty to the great unifier, the Marshal. In the case of the jade columns, a further – perhaps more private – symbolism was at work too. The Cathedral in Warsaw from which they came had been designed by Szyszko-Bohusz’s teacher in St Petersburg before the First World War, Leon Benois. This expression of patriotism was also, perhaps, one of patricide. Piłsudski House, Oleandry, Kraków (source: wikicommons). Viewed today, the Józef Piłsudski House looks perhaps more like the abstract architectural compositions of the interwar avant-garde than Szyszko Bohusz and his co-designer, architect Stanisław Strojek, intended. A central, five-story vertical block is connected to four-story block set back from the street line. The staggered footprint and stepped profile, combined with high canopy that turns the corner of the building, lends it a dynamic form. The long windows in the stairwell and a glass-walled service unit breaking the roofline add transparency, particularly when lit at night. The building is, however, incomplete. It is only the southeastern corner of what was planned to be a much larger complex. In Szyszko Bohusz and Strojek’s design, three wings arranged around a courtyard were to be connected by an elevated, double-height arcade. Whilst the design was coded with modernist elements, most obviously the strip windows and flat roof, the full scheme was far more conventional, even retrospective in form. It was to have the axial symmetrical arrangement of classical Greek temples like the Pergamon Altar (which in 1930 had been reopened to the public in Berlin after many years of closure) or even a gymnasium, the training ground for competitors in Greek games and the meeting place of poets. Other closer-to-home precedents of this compositional form include the neo-Classical Saxon Palace in Warsaw (remodeled by Adam Idźkowski, 1839-42) with an imposing colonnade accommodating the grave of the unknown soldier from 1925, perhaps the most important of all the public monuments in inter-war Poland. These allusions emphasized the self-image of the Legionnaires as a brotherhood of warrior-poets whose loyalty to the state was incontestable. Occupying the site of mythical event marking the ‘call to arms’, but dressed in the architectural language of the present, the Józef Piłsudski House pressed the Legion’s claims to contemporary relevance (claims which were to put to the test in September 1939). ‘Piłsudskism’ – with its strong attachment to the figure of the powerful leader, valorization of military valour and heroic death, as well as belief in the authority of the state – has been compared to Italian Fascism. To this one might add, that Il Duce – like the Sanacja Regime in Poland – was undecided on matters of architectural style. Without a clear steer, modernists and traditionalists in Italy vied for influence. Whilst some promoted conservative, neoclassical styles as a way of reviving the splendor of ancient Rome (Romanità), others promoted modernism as the means to represent Italy as a modern industrial state. Even the most ambitious of the ‘Rationalists’ – as Italian modernists were known, made reference to tradition in an effort to draw on italianità (Italianness). Giuseppe Terragni’s Casa del Fascio in Como (1932-34), the best-known building conceived by a member of the group, is a case in point. His design for the local party headquarters was based on the play of volumes and voids, reflections and screens within a carefully proportioned, regular framework of blank white walls, slender columns and floors. The starkly modernist and abstract character of this white cube was undeniable. But the building also struck ideologically resonant notes of tradition: the ground plan – organised around a courtyard under glass – made reference to the spatial traditions of the palazzo as did the use of marble facings. With its underlying classicism, Szyszko-Bohusz’s scheme for the Józef Piłsudski House might well be understood as a near cousin of Terragni’s Casa del Fascio. Polish architectural writers were keen find parallels between Fascist Italy and their homeland in the 1930s. Buildings like the Józef Piłsudski House in Kraków – one example of many such ‘hybrid’ designs which sought to harmonise tradition with modernity in the 1930s – seems to lend weight to these claims on kinship. But perhaps some limits need to be placed on this analogy. Few schemes as bizarre as those created in Italy were realized in Poland. Consider, for instance, the Foro Mussolini, a classical sports stadium in Rome initiated in 1928, was ornamented with bold antique mosaics in the Roman manner depicting a motorised truck carrying flag-waving squadistri, paramilitary gangs associated with the struggle for power at the beginning of the 1920s. Moreover, the turn to monumentalism was common across Europe and across ideologies. Jan Parandowski argued for a more subtle understanding of Poland’s relationship with Italy or, more precisely, what he called ‘łacinskość’ (which might be translated as Latinity), in an essay with the marvelously capricious title, ‘Poland Lies on the Mediterranean Sea’ at the end of the 1930s. For Parandowski, a classicist and literary critic, the romantic period was a kind of long interregnum: ‘Romanticism lasted longer in us than anywhere else, because it was more profuse, more wide-ranging and with loftier content. Our entire nineteenth century was, in fact, romantic. Józef Piłsudski, a steel-willed man of action, was a romantic. The works of Juliusz Słowacki, second only to Mickiewicz as our Romantic leader, accompanied Piłsudski throughout his life. His [Słowacki’s] verses were … quoted in his daily commands’. But this was not the characteristic flattery of the cult. Romanticism had served its purpose, according to Parandowski, but had also obscured deeper structures of connection with European culture. This was to be found in the unconsciousness of language. In its grammar and orthography, Polish is a Latinate language. Recognition of this fact could be a step the recovery of deep and long traditions that connected Second Polish Republic with the first, the Rzeczpospolita, the age of humanists like Jan Kochanowski. Perhaps echoes of Szyszko-Bohusz’s antiquarianism can be heard here. His various schemes on Wawel – the presidential interiors, the Pantheon project and the entrance to the crypt containing Piłsudski’s body, as well as the Bem Mausoleum in Tarnów and his modernist works – were united by an underlying classical order. They formed both his contribution to the Piłsudski Cult and, in their severe and idiosyncratic style, his attempt to discipline it. Szyszko-Bohusz cited by Piotr Gacek, ‘Wawelskie życia Adolfa Szyszko-Bohusza’ in Architektura (May 1988), p. 18. Wawel zawsze tworzył odrębny świat sam w sobie. W tym mikrokosmosie, jak w miniaturze, odbijały się wszystkie zdarzenia historyczne polskie, nieraz będące jak-gdyby jaskrawszą edycją tego, co spotkało potem całą naszą Ojczyznę. Tu na Wawelu stanął najstarszy kościół chrześcijański w Polsce, tutaj rozkwitła i przekwitła władza i potęga królewska, odbudowa Wawelu na kilkanaście lat wyprzedziła odbudowę niezależnej Polski. For a detailed examination of the Piłsudski cult, see Heidi Hein-Kircher, Kult Piłsudskiego i jego znaczenie dla panstwa polskiego 1926-1939 (Warsaw, 2008). Ryszard Mirowicz, Edward Rydz-Śmigły. Działalność-wojskowa i polityczna (Warsaw, 1988), p. ? M.B.B. Biskupski, Independence Day: Myth, Symbol, and the Creation of Modern Poland (Oxford, 2012) p. 16. Andrzej Szczerski, ‘”Nowa Europa” i Modernistyczne Enklawy’ in Andrzej Szczerski, ed., Modernizm na peryferiach. 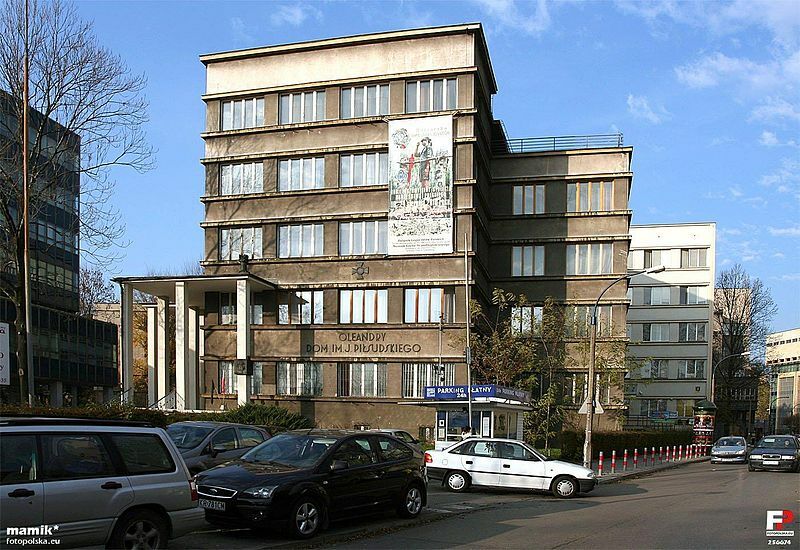 Architektura Skoczowa, Śląska i Pomorza 1918-1939 (Warsaw, 2011) pp. 239-44. Barbara Bułdys, ‘Mościce – A Dream of Modernity’ in Tarnów. 1000 Years of Modernity (Warsaw, 2012) p. 139. Ewa Chojecka, ‘The Castle Manor of the President of the Republic of Poland in Wisla and Tugendhat Villa in Brno – Two Contradictory Formulae’ in Architecture of Civil Engineering Environment, 5 (2008), p. 6. See Halina Billik, Zdisława Chojnacka, Agnieszka Janczyk, ‘Wawel – narodowi przywrócony: obchody 100-lecia powrotu Wawelu do Polski’ in Muzealnictwo, 46, (2005) p. 67. The Hungarian regions included those which had been given to Romania according to the Treaty of Trianon of 1920, making the monument also one to Hungarian irredentism. For a detailed discussion of the treatment of Piłsudski’s body after his death see B. Kwiatkowski, Mumie. Władcy, święci, tyrani (Warsaw, 2005). Szyszko-Bohusz cited by Mieczysław Wallis, Lata nauki i mistrzostwa Stanisława Noakowskiego (Warsaw, 1971), p. 266. See Grzegorz Gill, ‘Baldachim Wawelski. Symbolem odrodzonej Rzeczypospolitej w 1918 r.’ in Sowiniec, 34-35 (2009) pp. 91-94. Witold Molik, ‘”Straż nad Wartą” Pomnik Bismarcka w Poznaniu (1903-1919)’ in Kronika Miasta Poznania, 2 (2001) pp. 91-108. See Piotr Paszkiewicz, Pod berłem Romanowów, Sztuka rosyjska w Warszawie 1815-1915 (Warszaw, 1991) pp. 114-37. Piłsudski cited by Andrzej Garlicki, U źródeł obozu belwederskiego (Warsaw, 1983) p. 249. See, for instance, Leon Trotsky, ‘Pilsudskism, fascism, and the character of our epoch’ (August 4, 1932) in Writings of Leon Trotsky: Supplement (1929-33) (Atlanta, GA, 1979). Richard Etlin, Modernism in Italian Architecture 1890-1949 (Cambridge, MA., / London,1991) pp. 387-389. Simonetta Falasca-Zamponi, Fascist Spectacle: The Aesthetics of Power in Mussolini’s Italy (Berkley 2000) pp. 90-99. Diane Y. Ghirardo, ‘Italian Architects and Fascist Politics: An Evaluation of the Rationalist Role in Regime Building’, Journal of the Society of Architectural Historians, v. 39, no. 2 (May 1980) p. 188. Jan Parandowski, ‘Polska leży nad morzem śródziemnym’ in Arkady, vol. V, no. 3 (March 1939) pp. 113-6. Ibid ‘Romantyzm trwal u nas dluzej niz wszedzie, bo byl bardziej plodny, bardziej rozlegly, o wyzszej tresci. Caly nasz wiek XIX byl w gruncie rzeczy romantyczny. Jozef Piłsudski, czlowiek zelaznego czynu, byl romantykiem. Dziela drugiego po Mickiewiczu wodza naszego romantyzmu, Juliusza Slowackiego, towarzyszyly Piłsudskiemu przez cale zycie, wiersze poety … cytowal w swych rozkazach dziennych’.